Actually, I think the Lucius Malfoy wand that's inside the cane is made of wood. I may be wrong, but mine is chipped and beech-coloured underneath the black paint.. Ya mine is resin. Do you know how to fix the crack?? I managed to carefully bend it so that the wand was straight again. It was pretty flexible but there is still a crack in it and it will probably bend back soon. I would be surprised if a wand from the Noble Collection was made of wood. Not saying it isn't, but I would be surprised if it were. Also, the color of beechwood is pretty much the same as some pines and cottonwood... if it has a heavy grain to it, it might be oak. Resin can be fixed, but not to the same standards it was before the crack. If resin cracked, there were flaws in it when it was cast, plain and simple. It can be heated in real hot water and straightened (not boiling as it will completely melt). I'm talking like tap-water hot hot... Then cool it to harden it with cold water. Two people might be helpful for this... One to straighten (using a wooden ruler or other such straight thing to align the wand properly) and one to control the water temperature. Once the pieces are straightened, it's as simple as supergluing them together. I have a question... If the wand split and cracked... Did the wand have a core in it? I am also curious to know how much they are selling their wands. Yeah, mine's like that too. I think all the Noble wands are made of resin otherwise though. I am also curious to know how much they are selling their wands. I'd run them both under the hot water until they are movable... then, once they can be bent and placed together, turn the water to cold... leave them there for about a minute or so. This should stiffen up the parts. Afterward, use some superglue to mend the parts together. It's great, absolutely beautiful, I would very like to go there. You could wands also buy in London in Hamleys, I bought last summer Hermione's wand, it cost me 25 £. In Hamleys also they have brooms and other wands(Harry's, Ron's, Voldemort's). February will not be busy at all. Still if there is any kind of crowd it will be right when the park opens. My suggestion is to hit a few other things in the park before running right for harry potter. Also, like i suggested many times before. Make sure you revisit WWOHP at night before close. Hogsmeade looks great and its more fun to shop in the evening anyways because you don;t have to walk around with food and other merchandise while waiting in lines for rides and stuff. Last edited by Snuffy; December 23rd, 2010 at 3:49 am. Hey everyone, I'm Sam from Australia. New to the CoS forums hehe. Anyway, I am dying to visit the WWOHP. For those who have been, what did you all buy? I absolutely LOVE merchandise, haha, c'mon, who doesn't? Went yesterday, it was crazy how many people were there. You could barely walk. There were hour long lines just to go into the stores. The Forbidden Journey ride was very cool though. And there was no wait for the dragon challenge ride, which was odd. Butterbeer was alright, takes getting used to. It's really sweet. Ya, the park itself had to close due to compacity this week. It also happened at Disney world a couple times. We avoided the parks for *** most part this week cause of the crowds. Except for Christmas, we went to Epcot. As for the dragon challenge. Its a redone ride so a lot of locals skips it. But another reason why the ride lines aren't a long is because the trains move so fast. On the busiest of busy days that ride can keep people moving through. FYI for people who are going to Universal after this week. The crowds should die off and the park should be pretty empty until spring break. I am dreading going over Spring Break in April because of exactly this. Alas, as a teacher it is the only time my friend and I can both get off work to go. I am already anticipating ridiculous crowds, but I figure Potter with insane holiday crowds is better than not going at all. I'm actually excited to go at a time when Potter mania is probably at it's "last hurrah" in the months preceding the final movie. I'll probably change my tune after standing in a line for hours in the hot sun with screaming kids around, but I think it's neat to go when the mania is at an all time high for both book AND movie fans. 107 days to go! It was a spontaneous trip to Islands of Adventure for me. I have some cousins visiting and we decided to drive up to Orlando and back in one day (I live in Miami). Looking forward to going again because we didn't have time to go into any of the shops. And the interior of the Dragon Challenge ride is much better than what it was when it was called Dueling Dragons. I was just surprised that there was no wait for it when the place was so packed. Not sure if people read this Orlando Sentinel article, but its about the success of HP at Universal and execs talking expansion. The very last paragraph has me the most excited becuase not only does it confirm they will be doing something but it will have to include DH movies. Click HERE for the article. Although they won't discuss specific plans, Universal executives say additions to Wizarding World will happen at some point. The resort's licensing contract with Warner Bros. requires it to incorporate elements from the final Potter films, the last of which will open in theaters in July. Expansion sounds amazing! I just recently went to the HP theme park last week, and it was quite amazing. I was a little bit disappointed, though, because I felt that they could have done a ton more (lots of the shops were just visible from the outside and you couldn't actually go in), but expanding it would definitely make it a lot better. I would definitely go back a second time if it were expanded! "I never really gave up on you. I went in July, and the place was packed seeing as it had just opened. I loved it, but I can't really see where they could expand unless they took away some of the other parks. Frankly that whole Sinbad section could be toppled over and they could expand there. 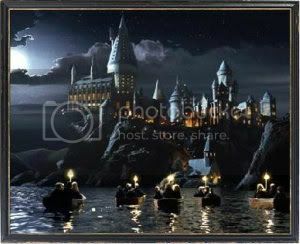 But even without the expansion it's something that every HP fan should go to. Just a suggestion though, go at night. Florida is a disgustingly hot state, and the lines only make it seem hotter. "Dobby has no master, Dobby is a free elf, and Dobby has come to save Harry Potter and his friends!" i'm hopefully going for my birthday in may..i was at universal in april for my sr class trip (universal.island of adenture) and saw hogwarts!!! amazing sight!!! it was beautiful!!! !